One aspect of the ultra-right-wing victories in the last election is that state legislatures have some new characters with some strange ideas. Connecticut is the latest state to see an attempt by legislators to tackle President Obama with proposed new laws on presidential eligibility. 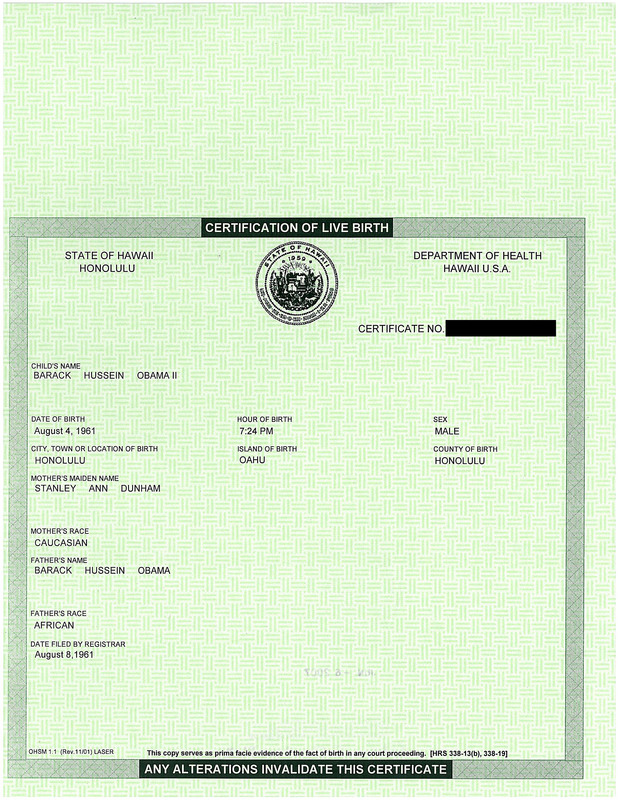 The law would require an “original birth certificate” to run for president and vice-president. The proposed legislation does not, however, define “original birth certificate,” a major flaw in my opinion. Should one of these state-based eligibility verification laws be passed, it will be interesting to see if there are court challenges and how the legal arguments play out. More fun and games for 2011. A complaint template has been created for the purpose of encouraging citizens of Hawaii to file it with the Attorney General of Hawaii against Lt. Governor of Hawaii Brian Schatz, acting as chairman of the Hawaii Democratic party, alleging that he committed fraud when he certified to the State that Barack Obama was the duly nominated candidate of the Democratic Party for president. The complaint asserts that Hawaii law requires that candidates so certified must be eligible, and that Lt. Governor Schatz did not verify this eligibility and that his certification was therefore fraudulent. Certainly many parallels have been drawn between the two astute politicians from Illinois who became president of the United States. I was reading a book about one of them, Team of Rivals: The Political Genius of Abraham Lincoln, just now when I came across a passage of relevance here. After his nomination as the Republican candidate for president, the renowned orator Lincoln refused speaking engagements and refused to authorize political statements, pointing only to his previous speeches and the Republican platform. He even refused to deny false statements made against him. Likewise, the birthers would gain a point if Obama responded to their demands. Newly appointed interim director of the Hawaii Department of Health, Dr. Neal Palafox, has abruptly resigned for reasons not yet disclosed, according to CBS News. 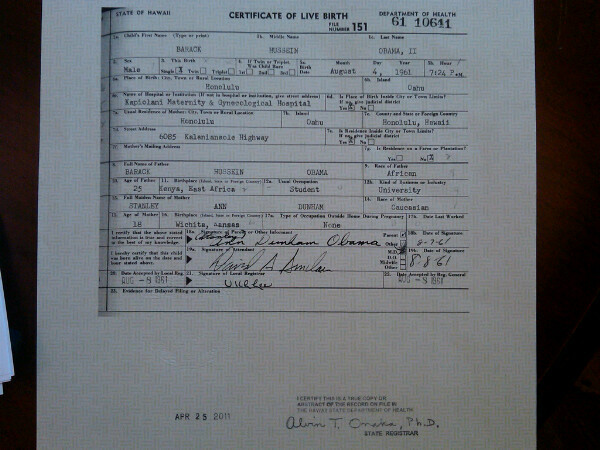 Birthers will say that this is proof that there is something wrong about Obama’s birth certificate. I speculate that it is a personal dispute with the Governor over now to spell “Neil.” Others cite rumors that Dr. Palafox is under investigation for insurance fraud. 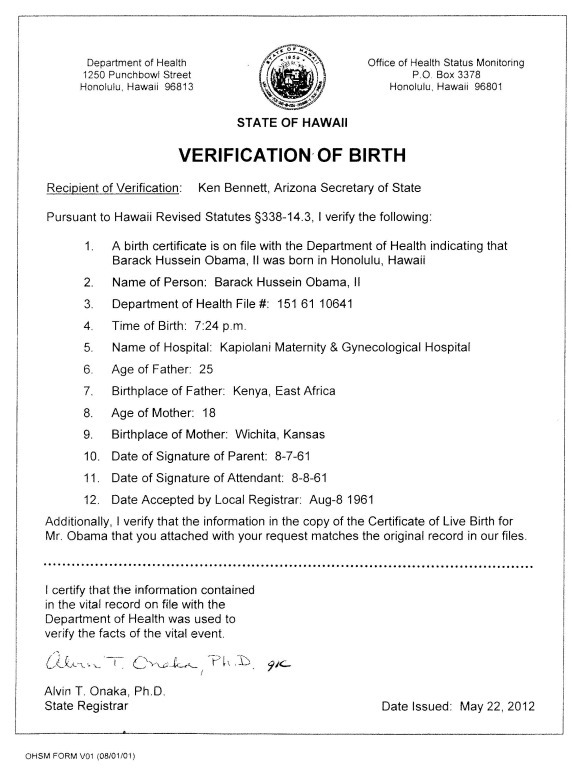 According to the Associated Press, five Hawaii representatives have proposed a new law that would allow the State to provide Barack Obama’s birth records at $100 a pop. 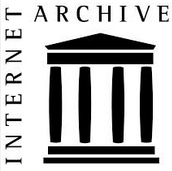 We saw previously that Hawaii Governor Neil Abercrombie’s attempt to slap down the birthers with evidence from the State Archives ran afoul of existing state law, but the legislature could fix that. Rep. Rida Cabanilla, says the fee would help offset the extra work by state employees who handle frequent phone calls and e-mails from people who believe Obama wasn’t born in Hawaii. 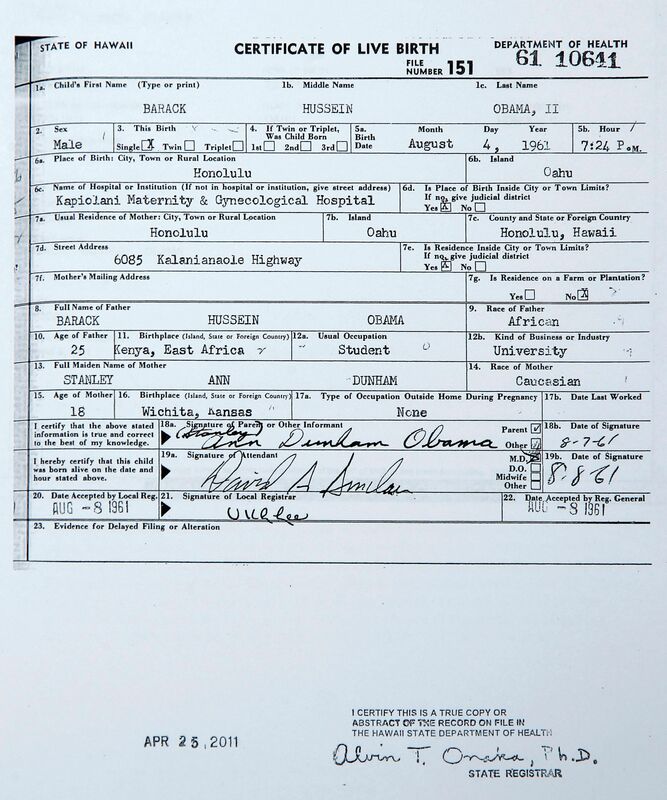 $100 is rather steep, but I really would like a framed copy of President Obama’s birth certificate on my wall as a trophy. I got the following email on the 10th, the day I left for vacation and only saw it this evening. I told this fellow in previous emails that I didn’t have time to deal with individual cranks, and that he should post on the blog. This is basically a regurgitation of Apuzzo I think (although I haven’t read Apuzzo lately). You’ve scoured the Internet and cannot find a single thing you say that backs my assertion? You must be blind indeed. Seeing that you act like a child then I shall treat you as one, doing YOUR homework since you admit lack of intellectual capacity. At the end of this rather lengthy letter I have some questions for you. I expect you to provide answers to MY questions.